T-Shirt orders are now closed. A limited amount will be available at the tournament. The winner of the t-shirt contest is Team Glow Distracts, a Division 1 team from Glen Forest Elementary School! 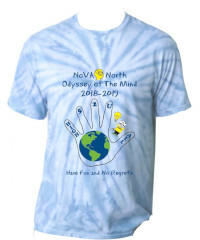 The shirts can be purchased with either a green solid background or a blue tie-dye background, as shown here. We are again offering an advance ordering option at a reduced price. 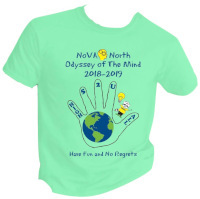 OPTION 1 (Advance Order): Orders placed by February 9 will be available for pickup on Saturday, February 23 between 8:30 am and 1:00 pm at Judges Training. These orders can also be picked up at Thomas Jefferson High School on Saturday, March 9 at the Regional Tournament, at the concessions table. They could also be picked up the evening before the tournament between 6:00 and 8:00 pm. OPTION 2 (Regular Order): Orders placed by February 23 will be available for pickup at the Regional Tournament (see above for details). All prices will increase by $3 per t-shirt. No orders will be accepted after February 23. OPTION 3 (Tournament Sales): A limited number of t-shirts will be available for sale on Saturday, March 9, at the Regional Tournament at the increased price level. There is no guarantee of availability or sizes, so teams are strongly encouraged to complete an Advance Order or Regular Order. These are the only available pickup dates and locations so we request that you plan accordingly. Include all t-shirts for a team on one order. Coordinators may combine multiple teams on one order or each team may order separately. Whoever places the order will be responsible for sizes and quantities ordered and for arranging pickup. No changes will be permitted and all sales are final. If your payment is not received by February 23, your order will be canceled. Payments can be made online or by check. You can pay online after submitting your order below. The mailing address for checks will be provided in the confirmation email you will receive. Note: When using PayPal, please enter the total cost in the Cost Per Item field on the payment form.